محمدنیا, ستوده, عباسی, محمد رضا, جوان دلویی, غلام, ازقندی, محسن. (1396). سازوکار گسله پیشانی کوهستان (MFF) زاگرس در طول جغرافیایی 46 تا 5/48 درجه شرقی. مجله ژئوفیزیک ایران, 11(4), 93-106. ستوده محمدنیا; محمد رضا عباسی; غلام جوان دلویی; محسن ازقندی. "سازوکار گسله پیشانی کوهستان (MFF) زاگرس در طول جغرافیایی 46 تا 5/48 درجه شرقی". 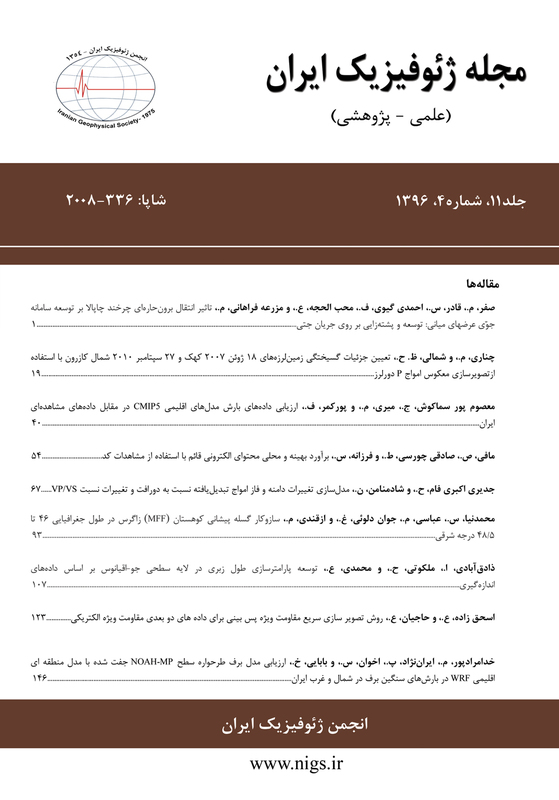 مجله ژئوفیزیک ایران, 11, 4, 1396, 93-106. محمدنیا, ستوده, عباسی, محمد رضا, جوان دلویی, غلام, ازقندی, محسن. (1396). 'سازوکار گسله پیشانی کوهستان (MFF) زاگرس در طول جغرافیایی 46 تا 5/48 درجه شرقی', مجله ژئوفیزیک ایران, 11(4), pp. 93-106. محمدنیا, ستوده, عباسی, محمد رضا, جوان دلویی, غلام, ازقندی, محسن. سازوکار گسله پیشانی کوهستان (MFF) زاگرس در طول جغرافیایی 46 تا 5/48 درجه شرقی. مجله ژئوفیزیک ایران, 1396; 11(4): 93-106. زمین‌ساخت زاگرس به خاطر پوشش لایه‌های نمک در پوسته به‌گونه‌ای است که حتی زمین‌لرزه‌های بزرگ نیز به‌ندرت به‌صورت گسیختگی به سطح می‌رسند و رخنمون دارند. از این‌رو عوارض گسله‌های فعال به‌آسانی امکان‌پذیر نیست. مناسب‌ترین روش مطالعه گسله‌ها در این‌گونه موارد استفاده از تکنیک‌های زلزله‌شناسی است. از اهداف مهم مشترک زلزله‌شناسان و زمین‌شناسان پی بردن به سازوکار گسله‌ها و شناخت گسله‌ مسبّب زمین‌لرزه است. از این‌رو حل سازوکار کانونی به روش‌های مختلفی در مناطق گوناگون انجام می‌گیرد. در این مطالعه با روش شبیه‌سازی شکل موج اقدام به حل سازوکارهای کانونی زمین‌لرزه‌ها در پهنه گسله پیشانی کوهستان شده است و به دنبال آن با روش برگردان حل‌های صورت گرفته به حل و بررسی وضعیت تنش و شناخت صفحات گسلی منطقه پرداخته شده است. برای تعیین میزان صحت و درستی سازوکارهای کانونی به‌دست‌آمده از روش پلاریته (اولین رسید موج) نیز استفاده شده است. روندهای غالبی که به‌عنوان صفحه گسلی همخوان با تانسور تنش انتخاب شده است به دو دسته خاوری- باختری و شمال باختری تقسیم‌بندی شده‌اند. آن دسته از روندهای خاوری- باختری با شیب رو به شمال همخوان با گسله پیشانی کوهستان هستند. همین روندها با شیب رو به جنوب در این منطقه تاکنون به نقشه در نیامده است. روندهای خاوری– باختری خود به دو دسته پر شیب دارای مؤلفه افقی بیشتر و کم‌شیب با مؤلفه شاقولی بیشتر تقسیم شده‌اند. One of the most seismically active parts of Iran is Zagros area. The basement-involved active fold-thrust belt of the Zagros in southwest Iran is underlain by numerous seismogenic blind basements thrust covered by the folded Phanerozoic sedimentary rocks. The present morphology of the Zagros active fold-thrust belt is the result of its structural evolution and depositional history: a platform phase during the Paleozoic; rifting in the Permian Triassic; passive continental margin (with sea-floor spreading to the northeast) in the Jurassic-Early Cretaceous; subduction to the north­east and ophiolite-radiolarite emplacement in the Late Cretaceous; and collision-shortening during the Neogene.Besides, there are a lot of different faults in Zagros, for example, the Main Zagros Reverse Fault (MZRF), the Main Recent Fault (MRF), the High Zagros thrust belt, the High Zagros Fault (HZF), and Mountain Front Fault (MFF). This study is focused on the last-mentioned one. The MFF flexure is introduced for the first time by Falcon (1961) and then is presented as the mountain front fault by Berberian and Tchalenko (1976)], which delimits the Zagros simple fold belt and the Eocene-Oligocene Asmari limestone outcrops to the south and southwest. The Mountain front fault (MFF), is a segmented master blind thrust fault with important structural topographic, geomorphic and seismotectonic characteristics. Therefore, the study and recognition of seismic parts of Iran are important. The aim of this study is to determine the focal mechanisms of Mountain Front Fault (MFF) at a latitude of 46 to 48.5 degree in Zagros. Due to the salt layers, large earthquakes rarely reach the surface. In such cases, the seismic method is an appropriate tool to understand the faulting mechanisms. By means of focal mechanisms, it is possible to gain information about the fault geometry and its related mechanism. The data used in this study are from International Institute of Earthquake Engineering, and Seismology (IIEES) and Institute of Geophysics of the University of Tehran (IGUT). Because of some wrong relocation, during this study relocated them to reach a well-relocated data base and better results. Getting the focal mechanism of an earthquake can occur in various ways. In this study, first, the waveform modeling by Isola software was used to find the focal mechanisms. To determine the accuracy of focal mechanism solutions obtained by waveform modeling, the polarity method was used to solve focal mechanisms. Besides, some of these earthquakes have also been reported by CMT. After determining focal mechanism solutions with the stated method, they were compared with CMT, and all the focal mechanism were mapped in the area so that the trend of this part of MFF can be recognized better. Because there are many earthquakes in this area, a reliable decision can be made. By looking at the maps, it is easily understandable that the trend in this part is obviously EW. Finally, the prevailing trend that obtained in the study area is found. Most of these earthquakes are trending EW. The study of 31 focal mechanisms in the area has permitted to constrain the faulting mechanism of MFF. عبادی، ر.، زارع، م.، سلگی، ع.، و سینائیان، ف.، 1389، مطالعه خطر زمین‌لرزه در محدوده جزیره خارک: فصلنامه زمین، 5(1)، 22-28. Alavi, M., 1994, Tectonic of the Zagros orogenic belt of Iran, New data and interpretations: Tectonophysics, 229, 211-238. Angelier, J., and Mechler, P., 1977, Sur une methode graphique de recherche des contraintes principles egalement utilizable en tectonicque et en seismologie: La methode des diedres droits: Bullitain Society Geology France, 7, 1309-1318. Angelier, J., 1975. Sur l’analyse des measures recueillies dans des sites failles: l’utilite d’une confrontation entre les methodes dynamiques et cinematiques: Academic Science Paris, 281, 1805-1808. (Erratum: Ibid (D) 1976, 283, 466). Angelier, J., 2002, Inversion of earthquake focal mechanisms to obtain the seismotectonic stress: A new method free of choice among nodal planes: Geophysic Journal International, 150, 588–609. Bahroudi, A., and Koyi, H., 2003, Effect of spatial distribution of Hormuz salt on deformation style in the Zagros fold and thrust belt: An analogue modeling approach: Journal Geology Society, 160(5), 719–733. Bellier, O., and Zoback, M., 1995. Recent state of stress change in the Walker Lane zone, western Basin and Range province: United States Tectonics, 14 (3), 564-593. Berberian, M., 1995, Master “blind” thrust faults hidden under the Zagros folds, Active basement tectonics and surface morphotectonics: Tectonophysics, 241(3/4), 193–224. Bouchon, M., 1981, A simple method to calculate Green's function for elastic layered media: Bulletin of Seismological Society of America, 71(4), 959-971. Carey-Gailhardis, E., and Mercier, J. L., 1987, A numerical method for determining the state of stress using focal mechanisms of earthquake populations, Application to Tibetan teleseismics and microseismicity of southern Peru: Earth Planetary Science Letter, 82, 165-179. Carey-Gailhardis, E., and Mercier, J. L., 1992, Regional state of stress, fault kinematics and adjustments of blocks in a fractured body of rocks: application to the micro seismicity of the Rhine graben: Journal of Structural Geology, 14(8/9), 1007–1017. Carey-Gailhardis, E., and Vergely, P., 1992, Graphical analysis of fault kinematics and focal mechanisms of Falcon, N. L., 1961; Major earth-flexuring in the Zagros Mountains of Southwest Iran: Quarterly: Journal Geological Society of London, 117, 367-376. Copley, A., and Nissen, E., Karasozen, E., Oveisi, B., Elliott, J. R., and Samsonov, S., 2015, Seismogenic faulting of the sedimentary sequence and laterally variable material properties in the Zagros Mountains (Iran) revealed by the August 2014 Murmuri (E. Dehloran) earthquake sequence: Geophysical Journal International., 203, 1436–1459. Falcon, N. L., 1974, Southern Iran: Zagros mountains. In: A. Spencer (Ed. ), Mesozoic- Cenozoic Orogeny Belts: Special. Publication: Journal Geological Society London, 4, 199-211. Hessami, K., Jamali, F., and Tabassi, H., 2003, Major Active Faults of Iran map: International Institute of Earthquake Engineering and Seismology (IIEES), Tehran, Iran, scale: 1:2,500,000. Huber, 1977, Tectonic Map of Iran, 1:2500000, NIOC Exploration and Prosuctio, Husseini, M. I , 1988, The Arabian Infracambrian Extensional system: Tectonophysics, 148, 93-103. Kikuchi, M., and Kanamori, H., 1991, Inversion of complex body waves-III : Bulletin de la Société Géologique de France, 81, 2335-2350. Lay, T., and Wallace, T. C., 1995, Modern Global Seismology: San Diego, Academic Press, 521 p.
Lisle, R. J., and Orife, T., 2002. STRESSTAT: a Basic program for numerical evaluation of multiple stress inversion results: Computers and Geosciences, 28(9), 1037-1040. Mercier, J. L., Carey-Gailhardis, E., and Sébrier, M., 1991, Palaeostress determinations from fault kinematics, application to the neotectonics of the Himalayas-Tibet and the Central Andes: Royal society publication, 337(1645). Motagh, M., Bahroudi, A., Haghshenas Haghighi, M., Samsonov, S., Fielding, E., and Wetzel, H. U., 2015, The 18 August 2014 Mw 6.2 Mormori, Iran, Earthquake: A Thin‐Skinned Faulting in the Zagros Mountain Inferred from InSAR Measurements: Seismological Research Letters, 86(3), 775-782. Shabanian, E., Bellier, O., Abbassi, M. R., Siame, L., and Farbod, Y., 2010. Plio-quaternary stress states in NE Iran, Kopeh Dagh and Allah Dagh-Binalud mountain ranges: Tectonophysics, 480 (1-4), 280-304. Shan, Y., and Fry, N., 2006, The moment method used to infer stress from fault/slip data in sigma space, invalidity and modification: Structural of geology, 28, 1208-1213. Snyder, D. B., and Barazangi, M., 1986, Deep crustal structure and flexure of the Arabian platebeneath the Zagros collisional mountain belt as inferred from gravity observations: Tectonics, 5, 361-373.